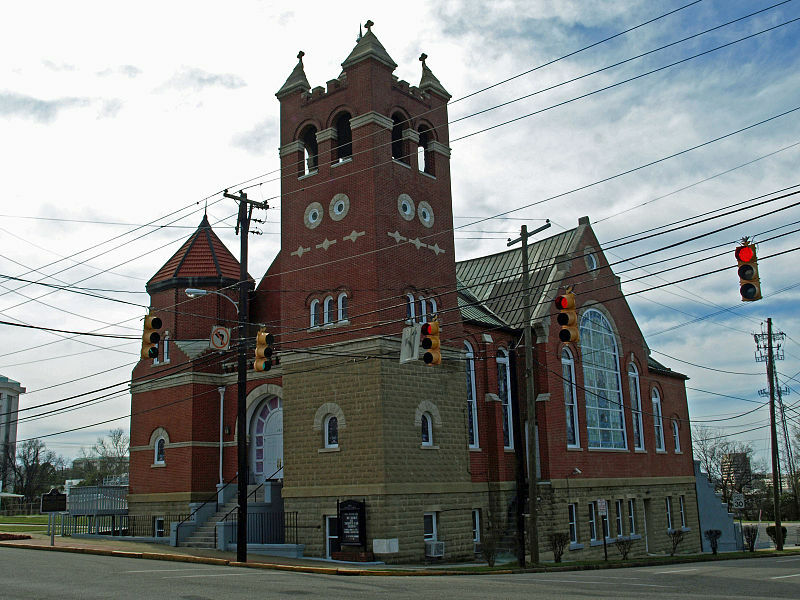 First Baptist Church Ripley Street. For the story of the “Brick-a-day” church click the link in the transcription. Kizziah Jackson was born into slavery around 1855 in Alabama. Her mother’s name was listed as Viola Jackson on her death certificate. I was unable to find either of them, or any of the siblings mentioned in her obituary, in the 1870 census. The 1870 census is the first one in which formerly enslaved people were listed by name. During slavery days we were listed by age and color under the slave holders name in a separate slave census. In the 1880 census, Kizziah Jackson was living in Bullock County, Alabama. She was the only adult in the home and was listed as single. She had two children, Nancy Jackson, age seven and George Jackson, age five. Nancy attended school. Kizziah worked as a cook and laborer. The 1890 census was destroyed by fire so we lose 20 years of records. In 1900 Kizziah Jackson was still in Bullock County. She was 45 years old and listed as a widow. She worked as a cook. Kizziah had given birth to four children and all four were living. The two youngest lived with her. Anderson was nine and attending school. James was five. 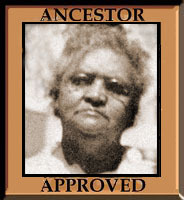 Nancy Jackson Brown, the oldest child, was 27 years old,. She was married to her second husband. Of the two children she had given birth to, only one daughter was still living. She lived with her paternal grandparents. I have not found son George after the 1880 Census. He would have been 25. In the 1910 Census, Kizziah and her younger sons had moved to Montgomery. They shared a home with Nancy. Her husband was not enumerated in the home. Nancy’s daughter died the year before in 1909, at the age of sixteen. Nancy worked as a washer woman. Anderson was 19 and worked as a porter at a grocery store. James was 16 and worked with a blacksmith. Everybody in the household, except Kizziah, was literate. No occupation was listed for her. There was one lodger, Mary McGee, who worked as a cook. In the 1919 Directory, Kizziah Jackson was living with her son James. She is listed as a domestic. He worked as a presser. Anderson was married and worked as a drayman. He lived on South Ripley. Nancy was a laundress and lived on Jeff Davis. 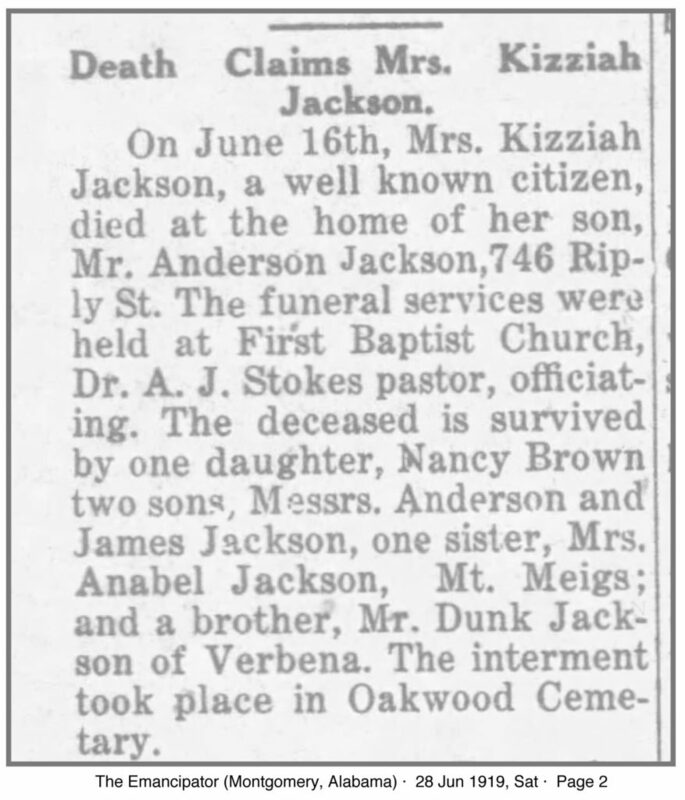 Kizziah Jackson died on June 16th at her son, Anderson Jackson’s home. She was buried in Oakwood Cemetery in Montgomery. 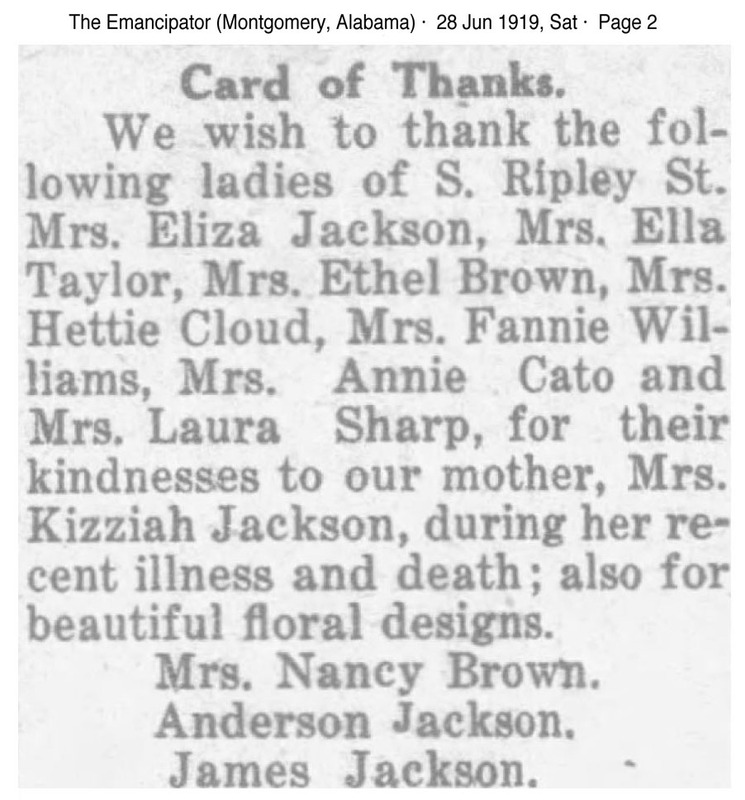 “We wish to thank the following ladies of S. Ripley St. Mrs. Eliza Jackson, Mrs. Ella Taylor, Mrs Ethel Brown, Mrs. Hettie Cloud, Mrs Fannie Williams, Mrs. Annie Cato and Mrs. Laura Sharp, for their kindnesses to our mother, Mrs. Kizziah Jackson, during her recent illness and death; also for beautiful floral designs. Another great life story. You have done so much work piecing these all together. Well done. This is so interesting, especially your first paragraph on how slaves were listed in a separate census. Excellent. It is really a problem when trying to track people who were enslaved. 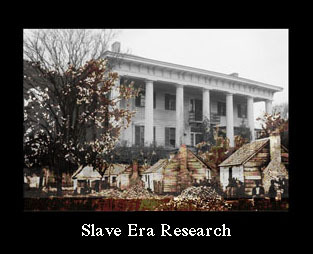 You have to rely on Wills, bills of sale and journals kept by the slave holder, instead of census records before 1870. How nice to acknowledge the ladies of the church. Have you used the Freedmen’s Bureau records to see if any of your people were mentioned there? I do sometimes look. So far I have only found information on other people with the same name. I should look more often, all the time in fact. Thanks for the reminder! I think the ladies mentioned are neighbors who helped out while she was sick because it says women of S. Ripley and that is the street her son lived on, where she was staying when she died. The church was First Baptist. This is the first time during this challenge that I’m visiting you Kristin. Hats off to you for such thorough research. To piece together life stories like you do is a such great service to keep these memories alive. 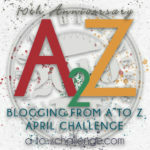 Thanks for visitin Arti, I’ve been enjoying your posts. “…separate slave census.” We have come a long way, yet there remains a long way to go. Thank you for keeping our eyes open. I’m sure it can be frustrating to find spots of information about family. Wow, so much information! You can really piece together people’s lives, and you are doing a great job. I like the thank you card at the end – what a lovely touch, to publically thank those who’d helped them during a difficult time. Separate slave census? that’s kind of heart stopping.